Kathy Adkins came to know The Salvation Army of Michigan City as many people do – through volunteering her time. In 2015, she began helping her local Salvation Army a few hours a week, mostly answering the telephone at the front desk and directing clients to the corps officers and staff. Now, two years later, that simple act of volunteerism and giving of her time to help others has evolved into something greater. 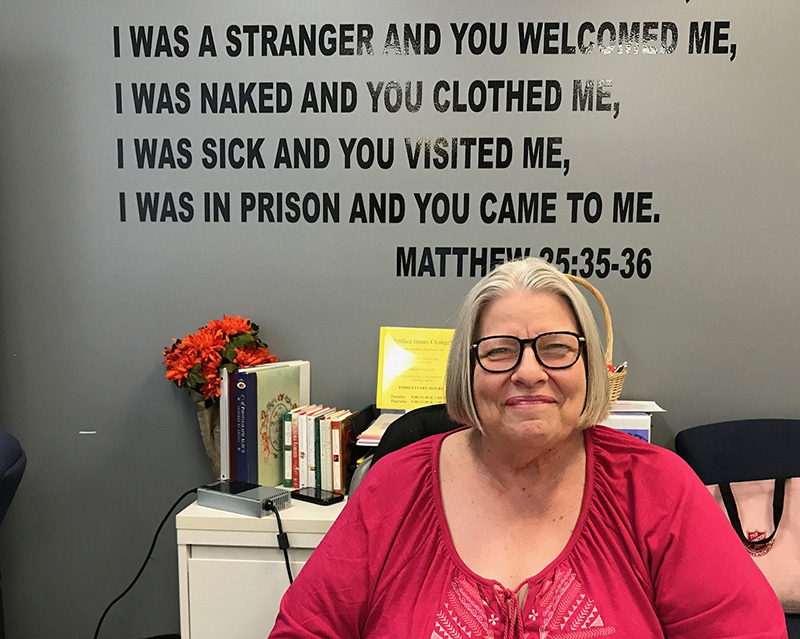 Kathy is now a part-time employee and a member of The Salvation Army Church. Her presence as the front desk receptionist is crucial to the everyday operation of the Michigan City corps. Over the years, our clients have come to know and love Kathy. She is an excellent liaison between our clients and corps officers. “This has given me a chance to relate to the clients, and I’ve made a lot of friends,” she said. She has an important role on pantry day, during special events and, of course, during regular business hours. She can answer just about any question she may get from the general public, and is always eager to help someone in need. One program that Kathy feels has made a definite impact in the community is the Army’s diaper bank. As part of her job, Kathy distributes diapers to needy families through this program, sometimes exceeding 5,000 diapers per month. “There are families out there that really need help with diapers,” she said. She loves that fathers also take the time to come in for diapers to help care for their children. Kathy came to The Salvation Army with a history of working as a nurse’s aide. She loved the personal care that came with that job, but always felt she was meant to do more. “You’ve got to help your fellow man,” Kathy said. She eventually became a church member, saying she believes so strongly in the mission statement that The Salvation Army adheres to. Kathy loves working for The Salvation Army because it allows her to help those who cannot help themselves – something she believes she was called to do.